I did not realize exactly how long it had been since the Irish beat the Spartans at home until they showed the date last night. I have been to some of the games that the Irish have lost in that time span. The date was September 18, 1993. I saw the flag planted on the field after the game in 2005. I was also there in 2003 when a late interception sealed the deal for the Spartans. I did not have the cameras that I had later in life, but the picture to the left shows Marc Edwards scoring a touchdown in the 36-14 blowout. What really made the game special was the fact that my high school team (LaPorte Slicers) had just beaten the Hobart Brickies for the first time in 45 years. I had a slicer shirt on at the game, and everyone kept coming up to me and congratulating me on the win. I did not have much to do with that win, but it was still a great feeling. Who knew that the end of one long streak would coincide with the start of another? 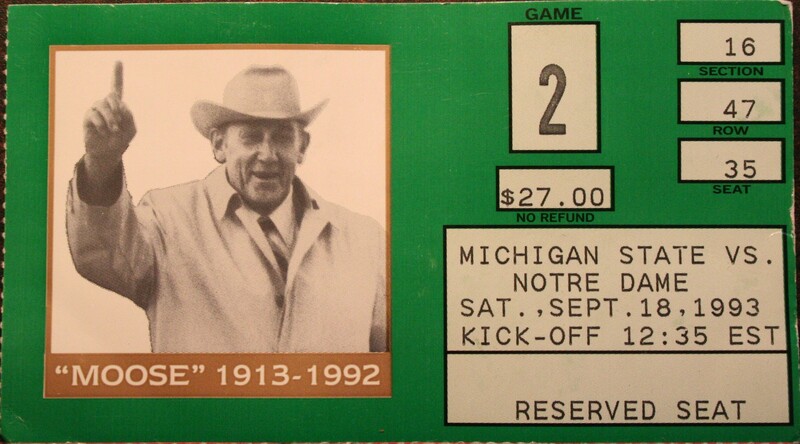 This was the second Notre Dame game that I had attended in my life. I figured I had two great reasons to post a little about the game.